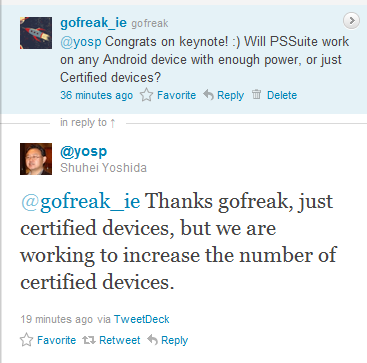 Sony will offer SDK for PS Vita this November. But what interests me the most is that it uses C#!!! I never expect that Sony will offer C# SDK. It looks like C# is becoming more and more popular in game development industry. 1 user thanked zato_1one for this useful post. Wow... Absolutely wow. Didn't see that one coming, after all the language is developed by one of their biggest enemy. But C# is a blast to develop with - I think Sony engineers think the same thing. C# is here to stay, better yet, it rises in gaming industry. Now I am curious though. What is the basis of their technology - is it Mono? Or is it the apache license micro .net(though it is very limited in class library so I presume it is Mono or proprietary version .NET)? Hopefully it is Mono as Xamarin needs big parters as Sony. And for MobileBits, this is straight invitation for You to implement a wrapper for the SDK Sony is providing - go for it I say! Never know about this before. But I think Wii is outdated already. Better wait for Wii U instead. I'm just thinking about it. Do you know if Unity also supports PS3 and Xbox360 via Mono? Yes, obviously. But remember that they just use Mono for scripting, all of Unity is native code (which is very different to how the Delta Engine works). I'm impressed with Mono team. I never know until recently that they also implement Mono version for console. I don't know how complete it is but it's still an impressive job, nonetheless. Well, to tell the truth, I'm quite puzzled when you put PS3 and Wii in Wiki (the info is still unavailable though). I didn't think it was really possible at the time. I've read from this page http://www.mono-project.com/Mono:PlayStation3 , it said that it runs on PS3 with Linux. But with new firmware upgraded of PS3, the users can't install other OS in PS3 anymore. Does this mean that there is a Mono version which can run on PS3 OS? I hope that someday Sony will establish its own indie community and provide an easier way to deploy the game on PSN like XNA community. Isn't this exactly what the PS Vita SDK is for? I am sure it will be extended to more Sony game devices in the future. Yes, I hope so. Like you said, it's possible that this SDK will be extended to support more devices and who knows it may support PS3 in the future too! Yeah, I hope it happens anytime soon. It's not that I forget about this SDK. But as of now there is still no more information about licensing, term of use and especially cost. So, I'm still somewhat skeptical about it. Just need to wait and see how it goes. By the way, I've searched Miguel blog and just found that he had developed Mono to run on PS3 native OS through PhyreEngine. But it's quite old so the project may not active anymore. Yes, good research. We have used/checked out the PhyreEngine for PS3 in 2009 as well and PInvoking it from C# shouldn't be very complicated (certainly easier than OpenGL or DirectX, which are very low level frameworks). Running Mono on such processor architectures is supported for a long time too (runs on all consoles, not just PS3, Xbox 360 and Wii are possible too), we just have to find a deal with the Xamarin guys in the future (right now they focus on mobile like we do).